Fall baking...Well, it's not officially Fall yet but it's starting to feel like it. Once the kids go back to school and labour day is over it's Fall for me. With Fall comes the urge to bake. I LOVE to bake. I love it even more when I create something that is both eye-catching and delicious. Heat oven to 375°F. Grease and flour muffin tin. 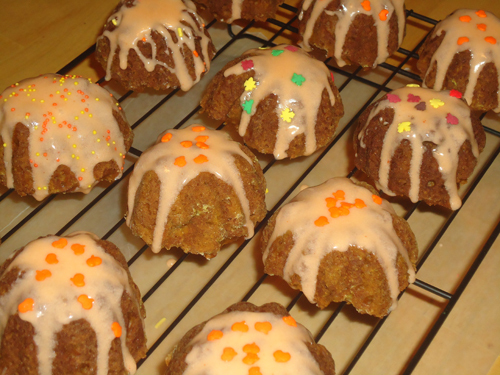 I used my pumpkin shaped muffin tin but you can also use a regular muffin tin. In a large bowl, mix flour, baking powder, baking soda, cinnamon, nutmeg, ginger and salt; set aside. In medium bowl whisk eggs and brown sugar together until smooth. Mix in pumpkin and butter until blended. Add egg mixture to flour mixture and stir until blended. Spoon batter into prepared tin, dividing evenly. Bake for 20 minutes. Cool for 5 minutes in the pan before removing and cooling completely on wire rack. To make the glaze, combine the cream cheese, butter, icing sugar and vanilla in bowl. Mix well until a nice consistency. Add orange food colouring. I used the gel type so it does not thin out the icing too much. 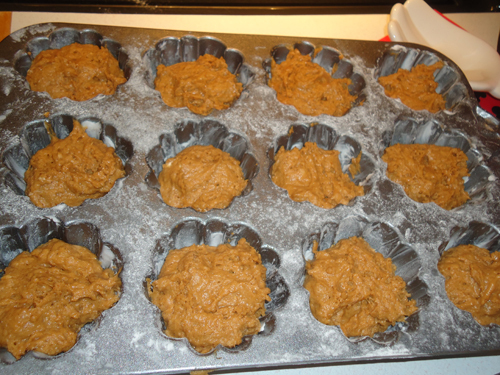 Place wax paper under the rack before drizzling the muffins. Makes clean up a whole lot easier later! Drizzle teaspoon full of icing over tops of muffins. 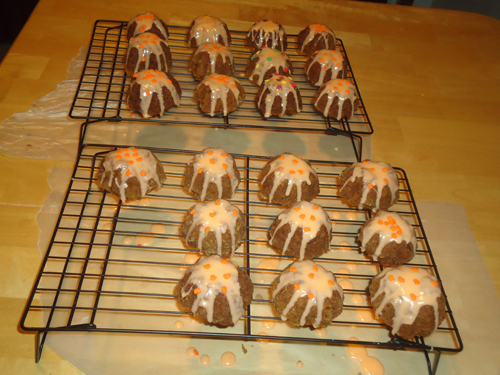 Once drizzled, I added some pumpkin sprinkles to compliment the pumpkin muffin and also some Fall leaves. Seemed a little early for the sprinkles but they just went together so well! And who says you can't eat or decorate pumpkins all year round!